This modern spin on the Scheherazade story is perfect for fans of Coraline and A Tale Dark and Grimm. With interwoven tips on writing with suspense, adding in plot twists, hooks, interior logic, and dealing with writer’s block, this is the ideal book for budding writers and all readers of delightfully just-dark-enough tales." I've been reading and enjoying J.A. White's The Thickety series immensely over the past few years and I was thrilled so see last year that he was releasing a new book. I didn't have a chance to read it until just recently, but my excitement never waned and I'm happy to say that this was another great book from White. The story centers around a young boy named Alex who finds himself lured into a witch's lair (currently masquerading as an apartment) and is subsequently trapped, forced to write and read the witch scary stories every night. This premise hooked me immediately because it has a storytelling aspect much in the vein of Scheherazade, the fairy tale influence of fairy tales, and that dark, quirky undertone that you can readily find in middle grade books like Coraline and other slightly darker middle grade fantasy books. 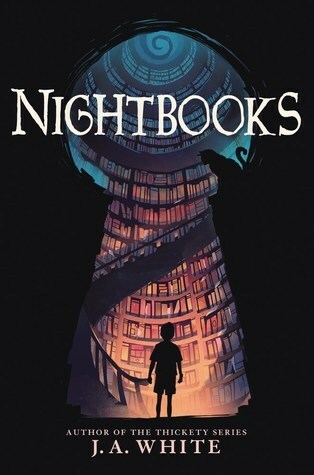 Nightbooks really comes through in the scary story department, not so much through the frame story, but within Alex's own stories and a few additional surprising elements throughout the book. When Alex reads his stories to the witch, the reader also gets to read and experience them. I don't generally enjoy reading stories or documents within a book, but I genuinely enjoyed reading all of Alex's short scary stories. They were perfectly creepy in ways that were appropriate for kids, but also still unsettling enough for adults such as myself to enjoy them. There is also a wide variety of surprises in this book that kept me entertained and guessing at every corner. Alex is an intriguing character. In a lot of ways, Alex is very similar to many other middle grade characters I've read, but there were definitely some things that set him apart in positive ways as well. His interest in the dark and scary side of movies and entertainment was one of them, and I really liked that White made his interest such a prominent role and example of it. I thought White did a wonderful job of showcasing that it's okay for kids to be interested in scary movies and monsters and that it doesn't make them "weird" for following their personal interests. I also liked seeing Alex's character grow, including how his insecurity grew into something more confident and sure as the story progressed. The only problems I had with this book are actually hard to put my finger on. There were moments where the narrative just felt a bit lacking and some scenes acted as fillers instead of substantive. I was also a little thrown by how easily Alex felt comfortable at the apartment at times and almost looked forward to having her listen to his stories. I also found the witch a little lackluster; she's supposed to be scary and powerful--and she certainly does seem powerful--but I really didn't find her all that intimidating and it was hard for me to understand the fear that Alex and another character he meets, Yasmine, had at times. Despite these issues, it's still a strong and enjoyable story that I'd recommend to any kid or adult who tends to like scary stories and movies--and who is always ready for a good story. Overall, Nightbooks is another success from J.A. White! I really can't wait to see what he writes next. Four stars from me! This sounds like a great read. I like the idea that there are scary stories within the main story. The cover is great too, the way it looks like a keyhole really draws my eye in.